• Lower the annual number of new infections by 25 percent. We would measure this with new diagnosis data, lowering the number of new diagnoses from 505 in 2009 to 379 (DHMH 2011e). • Reduce the HIV transmission rate (i.e., ratio of annual transmissions to number of people living with HIV), by 30 percent (from 3.87 persons new diagnoses per 100 people with HIV to 2.71 persons newly identified per 100 people with HIV) (DHMH 2011e). • Increase from 79 percent to 90 percent the percentage of people living with HIV who know their serostatus. The number of living cases in 2009 was 13,048. Assuming progress towards reducing new infections by 25 percent and no change in deaths, then the number of people knowing their status in 2015 will be 14,557, 90 percent of 16,174 (HIV prevalence) (DHMH 2011e ). While these goals are both ambitious and attainable, it is worth pointing out that this is merely the beginning of the long process of reducing HIV infection in Baltimore and nationwide. Even if the number of new HIV cases were reduced 25% from 505 to 379 for the next four years, that still amounts to over 1500 new infections. If the annual number of deaths related to AIDS follows suit and experiences a 25% decrease through 2015, there will be 540 AIDS-related deaths in that time. That’s almost 1,000 more HIV+ individuals in Baltimore by 2015 and that’s if the HIV/AIDS targets are met. 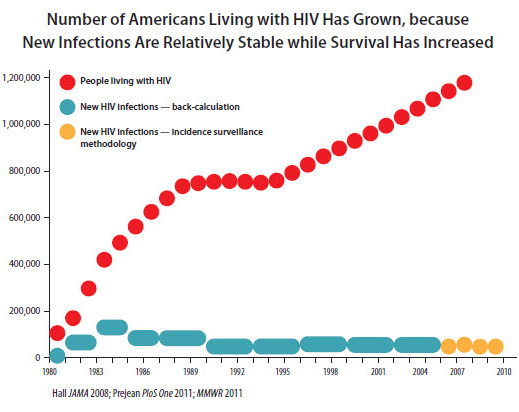 With people living longer with HIV/AIDS and a steadily growing incidence rate, it is paramount more than ever to pool our resources and work with other healthcare-related fields and with the community to continue our progress in fighting HIV. Ryan White funding from the federal government and local funding through initiatives like Healthy Baltimore 2015 has not been increasing recently and in some cases has decreased. When funding stagnates and your prospective client base grows, one of the best ways to continue improving services is through utilizing your peers both in and out of your department. Going it alone simply isn’t going to work. Especially in a place like The University of Maryland-Baltimore where there are so many uniquely qualified resources at your disposal, along with an outstanding and insightful community to draw from.